Applaws Chicken Lite Dry dog food contains 75% meat, and does not contain cheaper additives like cereal orgrains to bulk up the food. High protein, meat based diets are thenatural and healthy way to feed your dog as they are easier to digestthan other diets with large proportions of grains and cereals which canlead them to have a high carbohydrate intake and potential weightissues. 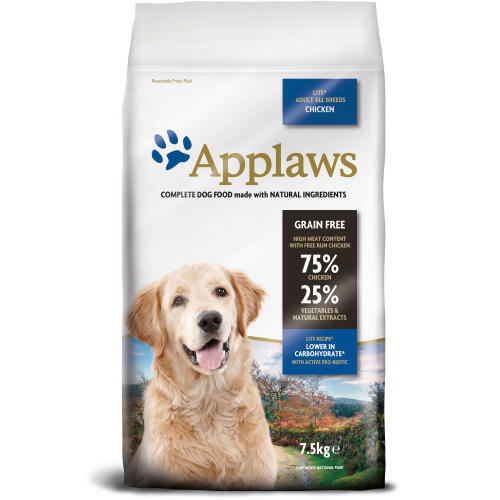 Applaws Lite has been specially formulated to provide a light diet compared to the standard Applaws diet. It is low in carbohydrate which can mean less build up of body fat. Instead it is made with high levels of natural meat protein which can help to produce lean muscle tissue and unlike cereal based light diets which can suffer from lack of taste, Applaws Lite is packed full of real meaty taste which your dog will love. Applaws can help your dog maintain a healthy and active lifestyle. Chicken 64% (from Dried Chicken), Chicken Mince 9%, Peas 8% (from dried peas), Potato Starch 7%, Poultry Oil 2% (source of Omega 6 ), Beet Pulp, Tomato (from Dehydrated Tomato), Poultry Gravy, Whole Egg (from Dehydrated Egg), Cellulose Plant Fibres, Minerals, Salmon Oil (source of Omega 3), Vitamins, Carrot (from Dehydrated Carrot), Chicory Extract (F.O.S), Alfalfa Meal, Seaweed/Kelp, Glucosamine, Methylsulfonylmethane, Chondroitin, Carrot, Peppermint, Paprika Meal, Turmeric, Thyme Extract, Citrus Extract, Taurine 1000 mg/kg, Yucca Extract, Cranberry, Fennel Extract, Carob Extract, Ginger, Rosehip Extract, Dandelion Extract, Rosemary Oil Extract, Oregano, Probiotic: Contains E1705 Enterococcus faecium cernelle 68 (SF68: NCIMB 10415) 1,000,000 cfu/kg as an aid in the establishment, maintenance and restoration of a balanced gut flora in dogs. Protein 37%, Crude Oils and Fats 16%, Crude Fibres 5.5%, Crude Ash 8.0%, Calcium 1.35%, Phosphorous 1.32%, Carbohydrates <25.5%. **Compared to Applaws Large Breed Adult Dog.